Wrapping up my Thanksgiving period blogs is a big Thank You for the painting movement called American Impressionism. When I think of movements that have influenced my own painting, American Impressionism is right up there with French Impressionism itself, and German Expressionism. Up until the time of the American impressionists, there were no inroads into the entrenched realism that dominated American painting. I guess I really just like artists who buck the established system—at the time the National Academy in New York that held itself to be the arbiter of American artistic taste. Just as happened in France in the 1870s, Impressionism was slow to catch on with critics and the public in the US, starting in the 1880s when French impressionist works were exhibited in America. When American artists painting in the style began exhibiting in the 1890s, they too initially found a cool reception. American patrons preferred didactic realism in the form of genre scenes, portraiture, and descriptive landscapes. While American impressionists presented depictions of real landscapes, their approach with broken color and active brush work did not initially fare well. Their style was considered unsophisticated by academic hacks. Childe Hassam studied in Paris for three years starting in 1883. Exposed to Impressionism, his palette lightened and he adopted the short, quick brush strokes of Impressionist (and some Post-Impressionist) painters. He returned to New York in 1890. By the mid-1890s, there were many artists painting in impressionist styles. Ignored by the National Academy and largely by the public, Hassam, along with nine other impressionists, formed the Ten American Painters (first exhibit 1898 in New York). The group was devoted to Impressionism, exhibiting outside official venues. 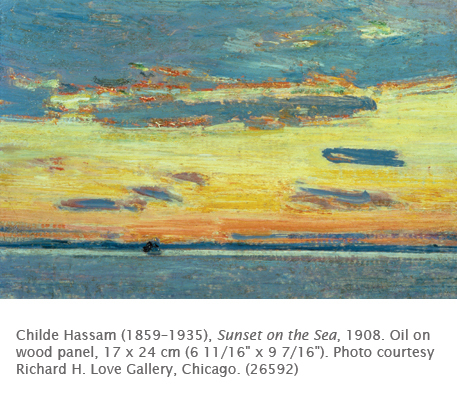 Hassam has always been my favorite of the American impressionists. His landscapes are absolutely gorgeous, and, like most of the American Impressionists (including Mary Cassatt), his interest in depicting the effects of light on color and form did not lead him to the total disintegration of the subject. Later in life, while still working in the Impressionist palette and fluid brush work, Hassam’s works bordered on expressionistic, as we see in this lovely seascape from one of his hiatuses in Cos Cob. Activity: Using tempera paint and various size brushes, create a fantasy landscape that emphasizes bright colors in either warm or cool families, related lines and shapes to create rhythm. Be sure to repeat the elements to create patterns and movement. Correlations to Davis programs: Explorations in Art Grade 1: 3.16, 4.21; Explorations in Art Grade 2: 1.5; Explorations in Art Grade 3: 2.12; Explorations in Art Grade 4: 3.14, 4.21, 4.22; Explorations in Art Grade 5: 6.32; A Personal Journey: 5.1; A Community Connection: 5.1; A Global Pursuit: 2.2; Exploring Visual Design: 4, 5, 6, 8.